Jonathan Chou and Dominic Decker say that the M.S. in Narrative Medicine program has shaped their medical careers in invaluable ways. 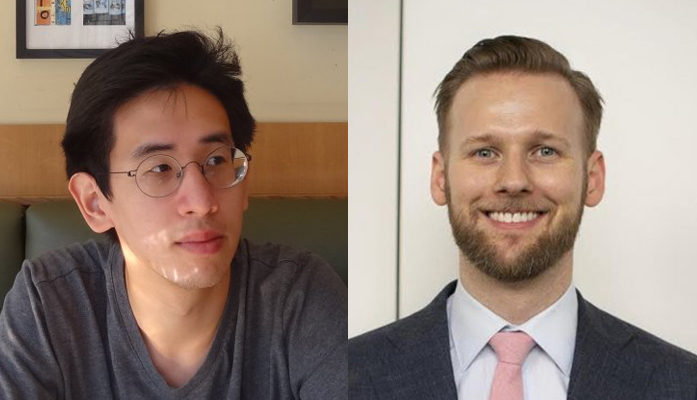 As they planned for careers in medicine, both Jonathan Chou (’15SPS, Narrative Medicine) and Dominic Decker (’12SPS, Narrative Medicine) nurtured interests in writing and expression that led them to the Master of Science in Narrative Medicine program at Columbia University’s School of Professional Studies. Emigrating from Taiwan to the U.S. in 2009 to obtain his undergraduate degree, Chou was drawn to English literature because it had an emotional appeal he didn’t find in science. Decker’s interest in narrative stemmed from his work recording doctor-patient encounters as an emergency department scribe. Chou, who is now a fourth-year medical student at the University of Southern California, and Decker, who is a third-year internal medicine resident at Rhode Island Hospital, both say that Columbia’s program shaped their medical careers in invaluable ways. We asked each of them three questions about their experience. Q. What attracted you to the program? Chou: There’s a real sense of relief or homecoming about the Narrative Medicine program because suddenly here’s this group of people saying things about medicine that you’ve thought for a long time but haven’t known how to say. So on the one hand, it was the promise of academic and intellectual fulfillment that drew me to the program, but then on the other, it was something related to finding a community and a sense of what I was going to do with my life. Decker: I planned to attend medical school eventually, but did not see the program as merely a stepping-stone to that goal. Rather, it was an individual entity that answered my questions and reinforced my skills in providing patient- and family-centered care and would have been beneficial whether or not I attended medical school. Q. What type of skills have you been able to build and improve on through the program? Chou: I became a better reader and writer, but what is more important is how the program changed my approach to medicine, both on an intellectual level, in terms of my thinking about what it means to care for another or to heal, and on the level of praxis, meaning my attitude toward patients and how I approach the therapeutic relationship. Decker: The program has helped me to navigate through times of extreme vulnerability in the lives of my patients and those who love them. I have further used these skills on a larger scale in my residency program by leading conferences on wellness and resiliency. Q. How has the program helped you through your medical career? Chou: I’m applying to psychiatry residencies right now and it’s interesting to think if I would still be going into psychiatry if I hadn’t done narrative medicine. It’s hard to overstate how much narrative medicine has shaped and likely will continue to shape my aspirations in psychiatry. In psychiatry, there is a desire to understand why people are the way that they are, and every day I will put into practice the skills and knowledge that I gained from studying narrative medicine. Decker: Narrative medicine fundamentally changed my approach to medical school. In my first weeks as a medical student, I was taught how to elicit a history from a patient in a formulaic, rigid way. I quickly deviated from this script and applied a narrative-based approach, which focused on the patient’s voice rather than my own line of questioning. This has set the tone for the majority of my patient encounters.